Why do this meditation: This meditation is categorized as a “medical meditation” by yogic science. The focus and pulsations interrupt the pattern and pathways of addiction. 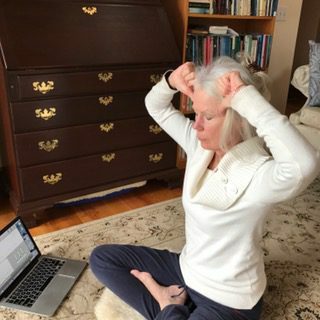 Start: Sit comfortably in a cross-legged position or in a chair, with a straight spine. Tilt the head down, and tuck in the chin slightly to open the back of the neck (neck lock or jalandhar bandh). Eye position: Keep the eyes closed focused between the eyebrows (brow point). Mudra: Close the hands into fists and place the thumbs on the temples. The pulsating pressure caused by the thumbs pressing against the temples in tandem with the moving jaw creates a rythmic pulse wave into the brain. As you silently vibrate the mantra, gently squeeze the molars (then release) with each syllable. Time: Begin with 5 minutes of practice and gradually work up to 11 minutes (or 31 minutes if desired). 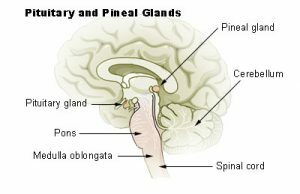 The pineal gland is activated by the movement, which in turn affects the master gland–the pituitary. This meditation corrects the imbalance in the glandular system and helps heal addictive impulses.